Everyone wants to make a RADIO. However a Crystal Set needs a number of components that are very hard to get: (tuning capacitor with knob) and (crystal earpiece for $1.25). The "air" TUNING CAPACITOR (20p to 415p) is not easily available and the postage is expensive. The germanium diode is a special component and the aerial coil wound on a ferrite slab is difficult to obtain. But you don't need these components. They can be substituted. There are hundreds of websites on the internet describing the CRYSTAL SET and if you want to build a "normal" set, you can Google these sites or 100 more Crystal Set plans. Many of them sell kits too. But this article is different. We are going to have all the fun of making a CRYSTAL SET but with modern components and easy-to-make components and with an amplifier stage. The output is loud so you don't need a long antenna. And we are going to make our own TUNING CAPACITOR and a very simple aerial coil (called a FRAME AERIAL) as well as replacements for the germanium diode (use a TRF radio IC or a transistor) and in place of hi-impedance headphones (use a piezo diaphragm) and a crystal earpiece equivalent (a piezo diaphragm). It's even better to have one of each type of component so you can compare the performance, so no matter how many parts your get, nothing will be wasted. We are also going to explain the fundaments of how the circuit works as even the simplest circuit has a number of very important features that are used in many other circuits. But first we are going to learn about the components and how they combine to make the circuit work. When two or more components are connected together they sometimes produce a completely different result to the capabilities of either item. This is the case with a capacitor and inductor in parallel. An inductor is simply a coil - turns of wire on a cardboard tube - called a former and the centre of the coil is AIR. It is called an air-cored coil or air-cored inductor. Each component (the coil and capacitor) is called a PASSIVE DEVICE - in other words it does not amplify, but when they are connected together they create a result very near to amplification. And they also produce a result of picking up a huge number of signals and only allowing one signal to appear across the pair. A truly amazing result. We start by placing a capacitor across the coil. There is so much activity in the air, from radio, TV, taxi and mobile phone usage that the air is filled with electromagnetic radiation. This radiation will cut the turns of the inductor (the coil) and produce a microscopic voltage in the turns. This is enough to start the two components passing energy back and forth at a rate determined by their values. This is the basis of our first discussion. These two components are called a TUNED CIRCUIT and make up our first building block called THE FRONT END. This consists of a coil and capacitor. These two components are in PARALLEL and the signal (called the RADIO SIGNAL or RADIO WAVE) passes through the centre of the coil and produces a voltage in the turns of the coil (the electromagnetic wave has to pass through the centre of the coil). The voltage produced from the wire at the ends of the coil is the result of a mass of signals that are interfering with each other and producing a signal called BACKGROUND NOISE. The voltage can be increased by an external aerial (called an ANTENNA), but it still consists of ALL THE LOCAL radio stations (and everything else). The voltage is a mass of signals and is absolutely useless as it represents all the stations AT THE SAME TIME. However, across the coil is a capacitor and these signals charge the capacitor with the very small voltage produced by the energy of the signals. When the capacitor is charged, it delivers its voltage to the coil. The coil accepts the energy and converts it to magnetic flux. After a very short period of time the capacitor becomes discharged and the magnetic flux collapses and produces a voltage in the coil of the opposite polarity to charge the capacitor again in the opposite direction. These two components keep oscillating back and forth, using the tiny amount of energy from the stations. There is a natural frequency for the capacitor and coil to pass energy back and forth and one of the stations will provide energy to assist this natural frequency. When this happens, the amplitude of the signal increases and the signals from all the other stations cancel themselves out and only one signal (waveform) remains. This signal is called the NATURAL FREQUENCY OF RESONANCE and it corresponds exactly to one of the radio stations. The end result is a waveform that is the exact same frequency as one of the radio stations and when voice or music is played, the amplitude of the waveform increases and decreases. This will be the signal you hear in the earpiece or speaker. It is called an AMPLITUDE MODULATED signal and that is where we get AM RADIO from. Understanding the concept of a CAPACITOR and INDUCTOR in parallel is very important. They form a TUNED CIRCUIT that has a natural RESONANT FREQUENCY. Here is a very similar analogy. You have a heavy metal ball on a long string attached to the gutter on your house - just like a pendulum. You can push the ball very lightly with a finger and after a number of pushes you will be able to get the heavy ball swinging in a very large arc. The only way to keep it swinging is to push it very lightly at exactly the right time. If you push it at the wrong time it will eventually stop swinging. The parallel tuned circuit is exactly like the ball. It wants to oscillate at a particular frequency. All the radio stations are pushing and pulling the circuit at the wrong times and nothing is happening. But one radio station pushes at exactly the right time and the circuit starts to oscillate. All the other stations are fighting each other just like one person pushing the ball sideways and another pushing the ball from the opposite side. The results cancel each other and you are the only one assisting the swing. The TUNED CIRCUIT can also be called a FILTER with a very narrow BAND-PASS frequency but our simple explanation describes the operation much more clearly. 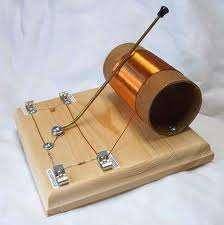 LOOP STICK ANTENNA -This is an alternate name given to the coil of wire wound on a ferrite rod or slab. It also has the name ROD ANTENNA or FERRITE ROD ANTENNA. 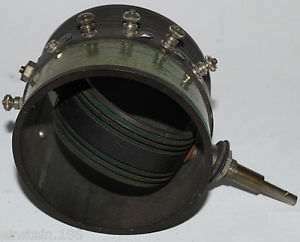 The winding can be enamelled wire or flexible wire called LITZ WIRE. This is very fine strands of enamelled wire twisted together and covered in cotton. The purpose of changing a thick wire to lots of very thin wires is to prevent the radio signals creating loops of signals within the wire and these signals will cancel each other and not produce a signal out the end of the wire. In our experiments, we have not noticed any difference in a coil made with ordinary enamelled wire and Litz wire. You can see the rod antenna, germanium diode, crystal earpiece, capacitor and resistor. The kit costs about $9.00 plus postage and includes knob, clips and screws but no board to mount the parts. The top clip connects to a long antenna. The left clip connects to ground and the right clip connects to a short antenna. Let me clear up a point. You do not need a ferrite rod antenna for the coil. 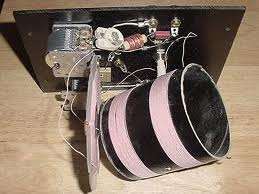 You can use an ordinary coil wound on a cardboard tube and it will work just as well if you are using an outside antenna. Here is the circuit using a home-made coil. The tappings on the coil allow a wide band of radio stations to be tuned. Each tapping allows a different portion of the band to be covered. The coil and capacitor must not be LOADED. In other words, you cannot connect anything to this combination because the signal it is producing will be "taken away" or "removed" or "considerably reduced" by the item you are connecting to the circuit. These two components are called a TUNED CIRCUIT and when they are not loaded they pick up all the radio stations and only one station will appear from the coil when the natural resonant frequency of the coil and capacitor exactly match the frequency of the radio station. The circuit actually "rejects" all the radio stations except one. Because all the other stations are trying to make the Tuned Circuit oscillate at a different frequency. The result of the TUNED CIRCUIT oscillating under NO LOAD conditions produces a waveform that is very high and this gives the circuit GOOD SELECTIVITY. The circuit can select one station and reject nearby stations. It also has good SENSITIVITY as it can pick up weak stations. If you load the circuit, only the strongest signal will be detected and it will be spread across the full range of the tuning capacitor. Obviously the theory is more-complex but we are explaining the end-result. Theory talks about the "Q" value of the coil and this is its ability to produce a very good output. The "Q" value increases when the circuit is not loaded. . Although these voltages are very small (in the order of microvolts or millivolts) the result is very important as the rest of the circuit will be amplifying this waveform a few thousand times. As we explained above, pushing the weight on a string only needs a push of 1 cm and eventually the weight will swing 1 metre. This is a gain of 100:1 The same thing happens with the tuned circuit. The incoming radio signal is in the order of microvolts, but the coil and capacitor will produce a signal as high as 500 millivolts. This is an improvement or "gain" of more than 1,000 and is referred to as the "Q" of the circuit. You will also notice the TUNED CIRCUIT is not connected to any supply voltage. It does not have to be connected. It generates its own waveform from the signals in the air. It should not have any DC current flowing through it via the supply as this would put a load on the circuit and reduce its operation. However we must "pick-off" the signal so it can be amplified. This must be done with a very high impedance circuit. The next part of the circuit is the CONVERTER. Commonly called the DETECTOR. It converts the RADIO FREQUENCY signal to an AUDIO FREQUENCY signal. This is the job of the DIODE. The radio frequency signal is a very high frequency signal (say one million cycles per second) and it is sending a tone of one thousand cycles per second through the air-waves. What is happening is this: The one megahertz signal has a certain amplitude and over a range of the first one-thousand cycles, the amplitude gradually decreases and then increases again. If you look at the tops of this 1,000 cycles you will see a waveform that corresponds to the one kilo-Hertz signal. The 1MHz signal is picked up by the coil and capacitor in the front end and makes it oscillate. The radio frequency signal is gradually getting larger over 500 cycles then smaller over the next 500 cycles and this increase and decrease represents the 1,000 cycles per second tone. This is the waveform (the signal) that passes through the diode. This will be explained further in a moment. The diode does not pass any signals less than 200mV as the first 200mV is lost in the junction of the diode. This means the signals start to appear on the other end of the diode when they are above 200mV. Across the crystal earpiece is a capacitor. The capacitor gets charged via the diode. The diode is present to stop the capacitor getting discharged when the waveform is in the wrong direction. (by this we mean - when the waveform is lower or smaller in amplitude than the voltage on the capacitor). And the waveform is in the wrong direction about 50% of the time. To charge the capacitor for one-half-cycle requires 500 "little increments" in voltage with each increment adding a microscopic increase in voltage. We don't want this voltage to reduce when the waveform is reversing direction and the diode stops the voltage flowing back to the Tuned Circuit. During the next half of the cycle when the pulses are getting smaller and smaller, the voltage on the capacitor is "bled off" by the load resistor. The crystal earpiece detects this voltage. What we mean, is the diode allows the voltage to rise (increase) on the capacitor via lots of little "pulses" and the voltage increases in the form of a sinewave to a maximum amount. This voltage is passed to the crystal earpiece. Once the voltage rises to a maximum, the little pulses of energy are not quite as strong, and the voltage on the capacitor reduces to form the second portion (quadrant) of the sinewave. This voltage is always being passed to the crystal earpiece and you can hear it as an audio signal. The preferred type of diode for a Crystal Set is germanium. This is because it drops only about 0.3v. But a silicon diode can be used, even though it drops about 0.7v, if the radio stations are very loud (close by). You have to remember, you need a very good aerial (and a water-pipe earth) to get any results with a Crystal Set because you are asking the signal to provide the energy to drive the earpiece. By simply adding a transistor, you are improving the performance 100 times and the long antenna can be reduced to a FRAME ANTENNA and the earth can be the metal frame of your soldering iron. The earphone or earpiece used in a Crystal Set must be a high impedance device because the crystal set does not produce a high current and cannot drive a low-impedance earpiece. That's why a CRYSTAL EARPIECE is ideal. It has a crystal glued to the back of the earpiece and connected to its top surface is an aluminium diaphragm. When the crystal expands and contracts as a result of a voltage applied via two electrodes, the diaphragm moves and you can hear the signal. It exhibits a very high impedance because it consists of a crystal and no coil of wire is contained inside the case. 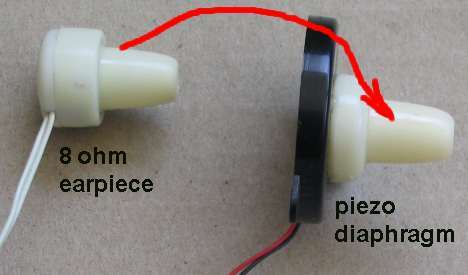 If you do not have a Crystal Earpiece, you can make your own from the shell of an 8 ohm earpiece and a piezo diaphragm. Only the front part of the earpiece is used. Hit the 8 ohm earpiece on the side and the front comes off. Glue the front onto a piezo diaphragm with hot-melt glue. See photo above. The piezo diaphragm is a ceramic substrate that deflects in the presence of a voltage. It is quite sensitive and you can hear the audio quite clearly. The waveform emerging from the diode in a Crystal Set is called AUDIO and although it has an amplitude of a few hundred millivolts, it does not have any current associated with it. The crystal earpiece and the piezo diaphragm react to this voltage. The 8 ohm earpiece can be used with our 8ohm Buffer stage shown below. Earpieces and headsets from mobile phones are 16 ohm or 32 ohm per earpiece and are terminated via a stereo 2.5mm or 3.5mm plug. The earpieces are connected in SERIES to get the best coupling to our radio circuits and you need to find the two pins on a stereo socket to produce series connection. Get a multimeter and switch to "ohms." Try all the pins and you will get a click in the left ear then the right ear. Keep searching until you get a click in both earpieces at the same time. Use these two pins. The biggest problem with a Crystal Set is the need for a long antenna. The first 200mV to 300mV of a signal is lost in the diode and you need a long antenna to pick up a signal so the output of the TUNED CIRCUIT has enough voltage to drive the high-impedance earpiece. This requires an outside aerial 5 metres long and 3 metres high. This is not practical for most hobbyists so we will be adding an amplifying stage to the crystal set so a shorter (smaller) aerial can be used. 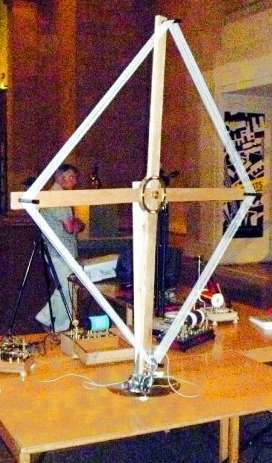 An equally-good substitute is a frame antenna made by winding insulated wire in a rectangle around wooden sticks. The Frame Aerial can be as large as 100cm x 100cm or as small as 10cm x 10cm around a plastic chocolate box. This will work just as good as a ferrite slab antenna. The slab antenna is just 100 times smaller. The slab antenna was invented so a transistor radio could be built in a small case. But if it is not available, you can wind 20 turns around a plastic chocolate box and it will work just as good. Alternately you can wind 20 turns around a biscuit tin. Put a pencil on the tin and wind the turns over the pencil too. Remove the pencil and it will be easy to remove the turns. Use tape to keep the turns together. The FRAME AERIAL does two things. It picks up the radio waves and it becomes the coil (called the INDUCTOR) in the TUNED CIRCUIT. It must be placed away from metal objects, such as a refrigerator. There is no point making a complex BASKET WEAVE COIL as it will not work any better than simply jumble winding all the turns at the maximum circumference of the coil, because the energy capturing capability of the coil relies entirely on the amount of flux lines passing through the centre of the coil. By increasing the centre of the coil, the amount of flux is increased for the same coil size. 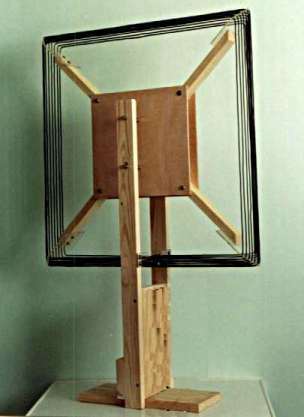 In fact, the simplest and cheapest is to wind turns around a box, as explained later in this article, or make a frame antenna as shown above. Technically speaking, a round coil has the best performance but only by a few percent. Whenever the size or shape of the coil is changed, (or the number of turns), the natural frequency of the Tuned Circuit will change and a different radio station will be picked up. This means tuning across the band can be done by altering the characteristics of the coil while keeping the value of the capacitor fixed. Changing the inductance can be done in many different ways. The coil can have taps every 5 turns and an alligator clip selects the correct tap. But very few radio stations will correspond exactly to each tap. The slider makes contact where the insulation has been removed. 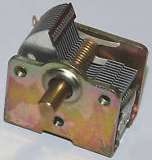 But it may touch two turns at the same time and create a "shorted turn" and reduce the "Q" of the coil. To tune across the radio band, the natural frequency of oscillation of the TUNED CIRCUIT must be adjusted (changed). This can be done by changing the value of the capacitor or the value of the inductor. The value of the inductor can be changed by adding or removing turns or changing the amount of magnetic material in the centre of the coil. A ferrite bar can be screwed in and out of the coil or slid in and out and this component is called a SLUG TUNED COIL. By changing the value of the 100p capacitor, different parts of the band can be picked up. The circuit above is has a broad-band amplifier consisting of 10 transistors (IC1) and they are directly coupled (connected) to each other because it is not possible to "manufacture" a capacitor inside the IC. The IC has 3 terminals (pins, legs) and it looks like an ordinary transistor. Experimenting with this type of IC has shown that it is no better than 2 ordinary transistors connected in a direct-coupling arrangement. Here is the address of the site for the slug-tuned radio. Unfortunately the site is in Dutch and the kit is not available. However the photos give a clear picture of the how the parts are connected. The inductance of the coil can also be altered by winding another coil and placing it near the first coil so that the magnetic field interacts with each other and changes the inductance of the circuit. This is called a VARIABLE INDUCTANCE TUNING COIL. You can have one coil inside the other, two coils near each other or two flat coils side-by-side. Any two coils will interact with each other. You can make your own FERRITE ROD ANTENNA by winding 60 to 80 turns of 0.25mm enamelled wire onto a 9mm ferrite rod or slab. If you wind it on a paper sleeve, you can move the coil along the rod to get the best performance. When the rod is slid out of the coil, the inductance changes considerably. However the inductance does change very slightly when the coil is moved along the rod. The "C" in the "LC" TUNED CIRCUIT can be fixed or variable. When it is variable, it is called a TUNING CAPACITOR. The sheets of aluminium in the air tuning capacitor below are called PLATES and the moving plates are called VANES. The fixed plates make up the STATOR. The space between the plates is AIR. The photo shows a single capacitor. If two capacitors are connected to the same shaft it is called a GANGED CAPACITOR. The plates do not come fully out of mesh and that's why the capacitor has a minimum value. The maximum capacitance is when the plates are fully meshed. The odd shape of the plates is designed to produce a fairly constant increase in capacitance as the shaft is rotated. The capacitor can be made much smaller by using thinner vanes and placing plastic between the vanes. Plastic increases the capacitance about 3 times to 10 times. The tuning capacitor can be replaced with a home-made equivalent that will work just the same. 4 sheets of aluminium foil (cooking foil) 10cm x 10cm. 4 sheets of thin cardboard 15cm x 20cm (cut A4 sheets in half). Tape a sheet of aluminium foil to each sheet of cardboard with sticky-tape around all 4 sides. Take one strand of wire from a length of hook-up flex and sticky-tape the end to each sheet of aluminium to make good contact. Place 2 sheets on top of each other and move the top sheet slightly to the left and sticky-tape the edge so they don't move. Do this with the other two sheets but move the top sheet to the right. Now interleave the sets. Connect the wire from the first sheet to the third sheet. Connect the wire from the second sheet to the fourth sheet. The cardboard (or paper) between the aluminium sheets increases the capacitance three times. The capacitance decreases when the sheets are moved apart and the capacitance increases when the sheets are moved in. The capacitance also INCREASES when the sheets are squashed together such as when a book is placed on them. You can also make a smaller capacitor by making each sheet smaller and using 6 sheets. You can then add a 100p or 220p in parallel with the home-made capacitor, to select the lower part of the band. Each circuit we describe in the following set of circuits is an improvement or advancement on the previous. We also offer a number of different types of aerial coils, amplifying stages and earphones. Some of the circuits use easy-to-obtain components and home-made equivalents for hard-to-get items. There will be something in this section for everyone to build. If the FRONT END (the Coil and Capacitor) is loaded too much by the "pick-off" of the amplifying stages, you will only get one station. If you get squealing or "motor-boating," try a different circuit and layout as the components you are using, plus the voltage of the battery, will need changing. You cannot always increase the voltage of the supply and get a louder output. Sometimes the increased voltage will stop the circuit working or it may introduce too much gain that the circuit starts to squeal. The Radio IC (ZN414) DOES NOT WORK on a voltage above 1.5v and some of the transistor circuits completely stop working with a higher voltage. This has to do with the biasing arrangements and if the circuit is designed for a low voltage, you need to keep to the suggested voltage and experiment with a slight increase in voltage and see what happens. Building a radio is not easy as the enormous amount of amplification of the combined stages creates a feedback loop via the power rail that sets the circuit into oscillation. This effect gets worse with a higher supply voltage and we will explain this further with each of the circuits. 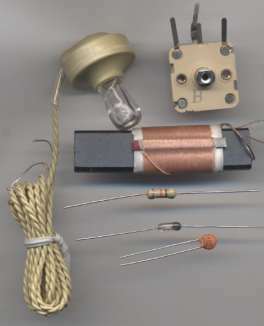 You can buy a CRYSTAL SET kit (see the photo of the kit, above) or the individual components (a kit is the cheapest) or use the replacement for the FERRITE ANTENNA COIL (16 turns to 20 turns on a 150mm biscuit tin) and/or the TUNING CAPACITOR made from aluminium foil and cardboard sheets. You will need an outside antenna and an earth (such as a water tap or the frame of your soldering iron) to pick up the radio stations. If you cannot put up an outside antenna, you will need to add one or more amplifying stages and this will allow you to reduce the length of the antenna and increase the volume of the audio. You can add two different types of amplifying stages to a crystal set. You can connect amplifying stage(s) to the FRONT END and these will be designed to put less load on the front end so the sensitivity and selectivity increases. These stages work at the frequency of the radio signal and they are called RF STAGES (Radio Frequency Stages). You can build these stages out of individual components or use a chip called a RADIO CHIP or RADIO IC (integrated circuit) for less than $2.00. The chip contains 5 stages of amplification and these are RF stages (or RF AMPLIFYING STAGES) and the concept is called TRF. (Tuned Radio Frequency). It is not easy to get this type of amplifier working because the stages produce a very high overall gain and you get a lot of "motor-boating" and squealing if the gain is not controlled. The gain must be reduced when a strong signal is being passed through the circuit because a strong signal will produce a large output and this will be so large that some of the waveform will find its way to the front of the amplifier via the power rail and start to be amplified again. To prevent the output getting too large, the circuit has a negative feedback line - called the AGC line - Automatic Gain Control. It would be very difficult to reproduce these 5 stages of amplification with discreet components and that's why it is best to use an IC. The next stage is a DIODE to convert the RF (Radio Frequency) to AF (Audio Frequency). This can be done with the diode-characteristics of a base-emitter junction in a transistor and we will show the alternatives. Any stages after the diode are AUDIO STAGES or AUDIO AMPLIFIER STAGES. The main job of the AUDIO AMPLIFIER is to increase the DRIVE CAPABILITY. In other words, increase the current capability of the circuit for an 8 ohm speaker or 8ohm earpiece (or 16 or 32 ohm). This is a very difficult thing to do and requires at least 2 stages. The LOAD you can put on a Crystal Set must be 10,000 ohms or higher. (if you put a lower resistance (impedance) on the output, you will load the FRONT END and reduce its ability to separate the stations. That's why a crystal earpiece is normally used with a crystal set. It puts almost NO LOAD on the circuit. If you put a load on the circuit the result will be only one or two stations across the whole dial and only the most powerful station will be received. This is a simple way of saying we want the 8 ohm earpiece to appear as 10,000 ohms to the crystal set. To produce an overall gain of 1250, we need two stages of amplification. If a transistor has a gain of 70, it will it will produce an impedance conversion of 70 times. This is a realistic value. Transistors with a gain of 200 will have a gain of about 70 when fitted to a circuit. This means the other transistor needs to have a gain of about 20 and that is easy to achieve. Adding stages to the front of a crystal set are called RF STAGES (Radio Frequency Stages) because they amplify the RADIO STATION SIGNAL. It does not matter if you amplify RF signals or AF signals. The result is the same. The only difference is this: The frequency of RF signals is much higher (1,000 times higher) and the coupling capacitors can be much smaller. This allows an RF amplifier to be built into an IC - called a Radio Chip. One of the most popular Radio IC's is ZN414 or YS414. This chip has been copied by other manufacturers as: MK484, TA7642 and LMF501T. All the chips are the same but the pinout is different. These chips work on a 1.5v supply and if the voltage is increased above 1.5v, the gain of the stages increases to a point of total distortion. To prevent strong signals producing distortion on 1.5v supply, the output is passed back to the input via a 150k resistor. This feedback line is called the AGC (Automatic Gain Control). The chip contains 5 stages of amplification plus a stage that converts the RF signal to AF (Detector Stage). This means the signal diode in a Crystal Set is not needed. Here is the circuit of the TA7642 Radio Chip. It performs the same as the ZN414 Radio Chip. By using the ZN414 radio IC (or any if the equivalents) you can create a POCKET RADIO to drive a headphone or speaker. But it is not easy to use the chip. The main problem is receiving the strong signals without producing distortion and then being able to pick up the weak stations. A fixed 100k feedback resistor does not provide adequate control and a TRF radio has limited capabilities. That's why radio manufacturers make SUPERHETRODYNE receivers. Even though they are more complex, the result is far superior. However a simple TRF set can be made with the Radio IC and a few stages of audio amplification. 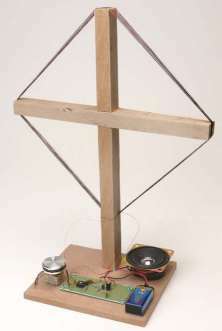 You can use a home-made FRAME ANTENNA or a home-made FERRITE ROD ANTENNA and a home-made VARIABLE CAPACITOR. Connecting the ground (0v rail) to the frame of your soldering iron or a water tap will increase the output volume. The circuit above shows a Crystal Earpiece. Using a Crystal Earpiece may require adding a 10n across the earpiece to improve the output volume. The substitute Piezo Earpiece is effectively a 20n capacitor and an additional capacitor is not needed. Here is a simple 2-Transistor radio. The secret to its performance is the 7 turn "pick-off" from the FRONT END (the TUNED CIRCUIT). The ratio of 7 turns to 60 turns means a small percentage of the voltage generated in the tuned circuit is passed to the transistor. Thus it puts a small load on the TUNED CIRCUIT. I don't want to go into any mathematics. The turns ratio is 60:7 = 8 but the effect of the 7 turns "pick-off" has an effect called the IMPEDANCE EFFECT and this is the SQUARE OF THE TURNS RATIO. Thus the IMPEDANCE EFFECT is 8 x 8 = 64. This means the "pick-off" (the LOADING EFFECT) is just a few percent. The front end can produce voltages as high as 500mV because a crystal set can produce a voltage high enough to pass through a diode (350mV) and have sufficient to drive a crystal earpiece. Even though the front end has a "step-down" ratio, the voltage out the 7 turns will be sufficient to drive the first transistor. The "transformer" does 2 things: It reduces the loading on the tuned circuit ENORMOUSLY and it produces an output with a higher current than is circuiting in the front end. Even though the transistor is turned ON and biased by the 33k, it is classified as a low-impedance load as far as the front end is concerned and the input signal has to be accompanied by a certain amount of current, otherwise the transistor will not respond to the voltage. The 7-turn "pick-off" is able to provide this current. Both transistors are biased ON via the 33k base-bias resistors and thus the first transistor responds to the slightest millivolt signal. This circuit was tested and had the same performance as the Simplest ZN414 Radio Circuit above. It can be operated on 1.5v to 6v and the strongest stations tend to overload on 6v. A short antenna is needed. You can add an IMPEDANCE MATCHING STAGE to the output of the circuit above so a low-impedance earpiece can be used. We call it an IMPEDANCE MATCHING STAGE because this is the correct technical term. It is an AMPLIFYING stage but it amplifies the CURRENT because the second transistor cannot drive an 8 ohm LOAD. 8 ohms is a very low resistance and if it is connected directly to the second transistor, the output will be almost zero. The reason for this is covered in our discussion: The Transistor Amplifier. This stage will not increase the volume but simply match the 8 ohm load to the circuit above. It is very difficult to connect a LOAD to this type of circuit because it will take more current from the battery and cause the supply voltage to fluctuate. These fluctuations will be passed to the first stage and cause variations in the signal. This will be amplified by the first and second transistors in the form of a low-frequency buzzing called MOTOR-BOATING. The only way to reduce or remove this noise is to add an electrolytic across the power rails and reduce the supply voltage. The third transistor simply takes the waveform on the output of the second transistor and delivers it to the earphone with a higher current. It is called an IMPEDANCE MATCHING STAGE as it effectively increases the 8 ohm load by a factor of about 100. You can use 16 ohm, 32 ohm or 64 ohm in place of the 8R earpiece and these will give better performance as they will take less current and improve the stability of the circuit. Low-impedance earphones create "motor-boating" due to the peaks of current and this can be very hard to fix. The next stage in our discussion, to get better performance, is a feature called REGENERATION. Regeneration sends a small output signal back to a previous stage in the form of POSITIVE FEEDBACK to INCREASE the original signal. The signal on the emitter of the first transistor is the same phase (moving in the same direction) as the signal entering the base but the FRAME ANTENNA has a turns ratio of 5:15 and this increases the signal on the receiving section of the antenna by up to 3 times. But we want the returning signal to be just above the amplitude of the receiving signal and so a resistive adjustment (attenuator) is provided on the emitter to deliver just the right amplitude. This has the effect of increasing the amplitude on the TUNED CIRCUIT and is just like reducing the load on the circuit. As we have mentioned above, when the tuned circuit is lightly loaded, it will pick up a station at the exact frequency of transmission and if the dial is changed slightly, the station will disappear. This quality is called SELECTIVITY. At the same time, the Tuned Circuit will pick up weak stations and this is called SENSITIVITY. The quality of a receiver depends on the loading of the TUNED CIRCUIT. 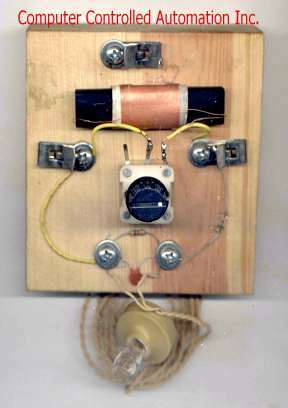 Here is the original circuit from Elektor Magazine with the prototype made on matrix board and fixed to a base-board with a frame antenna made from two sticks of wood. 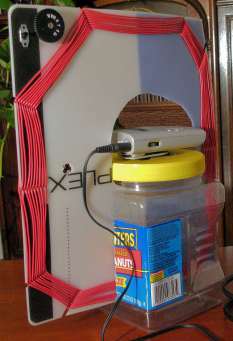 The photo shows a speaker but the output is so low that you absolutely need headphones. The circuit is very complex and the output will be very low as the circuit cannot drive a low-impedance earphone via a 4k7 load resistor. The 4k7 resistor is actually driving the speaker (the transistor is simply discharging the 220u). The 4k7 only allows 32/4700 x 9 = 61mV to appear across the earphone - a very poor result. Our circuit uses a 15 turn circular FRAME ANTENNA 15cm diameter and a 5 turn REGENERATION coil. The regeneration coil is brought near the main coil and as it gets closer you can hear the audio get louder. If this does not happen, turn the coil around. Early radios used this technique and the operator had to adjust the coil by hand. No-one minded because radio was a fascination and the simplest radio cost more than a weeks wages. To listen to a broadcast through headphones was an amazement and listeners would sit all night with headphones listening to music. This is very fiddly and by adding an extra buffer stage, we can use a Frame Antenna with a very clever "pick-off" that does not load the front end (loads it very little). This gives the circuit very good sensitivity and selectivity without regeneration. Here is our final design for the simplest self-contained 3-Transistor Radio using our home-made Tuning Capacitor and 250mm x 350mm Frame Antenna. It picks up the local stations and drives a low-impedance earphone or set of earphones (from a mobile phone). The circuit performs very well and uses readily-available components. The 22n across the output is essential to stop squealing. The secret to sensitivity and selectivity is the turns-ratio on the Frame Antenna. The 3-turn "pick-off" puts very little load on the front end and this allows the stations to be tuned with our home-made Tuning Capacitor. The circuit contains all the features we have discussed above and only needs a 1.5v supply. Build this circuit before you buy any expensive tuning capacitors, IC's or ferrite slab antennas as you will not get any better results. This is called a TRF circuit because the stages operate at Radio Frequency or Audio Frequency. Due to the high amount of amplification, the circuit can start to squeal (feedback, motorboat) due to the layout. You may need to shorten or lengthen the leads to the antenna or move the parts slightly - it's that critical. However the result is a portable radio that needs no earth and will pick up strong stations. You can try connecting the 0v rail to the metal part of a soldering iron to increase the number of stations. The whole success of picking up a radio station is the RECEIVING CIRCUIT. The receiving circuit is the coil and the signal in the air (from the radio station) must go down the centre of the coil. It cannot pass over the top or the bottom of the coil. 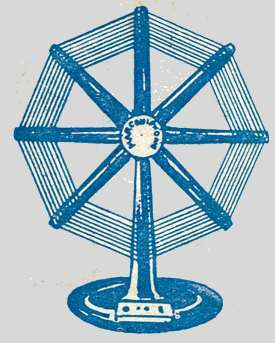 Only the signal that goes down the centre of the coil is received. As you can see, the centre of the coil is not very big and it is amazing that the signal can pass down the centre. But it does, and that is the only signal that will be amplified. This signal is passed to the capacitor and we have explained how the signal is gradually increased and increased in amplitude until it is as large as 500mV. These two components form a circuit called a TUNED CIRCUIT. It is also called a RESONANT CIRCUIT because it resonates or oscillates at a particular frequency. The signal from the radio station may be as small as a few millivolts, but as it keeps pushing the "swing" back and forth (see previous example of a swing in the txt above), the amplitude gets larger and larger. If you put your finger on the "swing" you will prevent it getting larger and larger and it only requires the slightest touch of your finger to prevent the swing gaining full amplitude. In electronic terms, your finger is called LOADING THE CIRCUIT and since we have to pass the signal to further stages of amplification, we need to "tap" or "load" or "pick-off" a signal. The aim is to load the circuit as least as possible because the actual energy entering the circuit is very small. In fact, this is all the energy we can remove as that is all the energy entering it. Because a very small amount of energy is entering the "front-end" we classify it having a very high impedance. It is very difficult to provide a value of impedance for this circuit because impedance has the term "Z" and the circuit is operating a very high frequency so resistance values are not the same as impedance values. The actual resistance of the circuit is ONE OHM but the impedance is more like 10,000 ohms to 100,000 ohms. We can explain its high impedance if we put a 100,000 ohm resistor across the circuit. The waveform will be reduced very slightly. If we put a 10,000 ohm resistor across the circuit, the signal will be reduced a reasonably large amount. If we put 1,000 ohms across the circuit it will stop working. This means a load of 100,000 ohms will have the least effect. In a crystal set, the diode creates NO LOAD until a voltage of 350mV is reached. It then passes excess voltage to a crystal earpiece that has a very high impedance. That's why a crystal set will produce a good output. The LOADING is very small. When a transistor is connected to the TUNED CIRCUIT, it starts to put a load on the circuit after 600mV and this load is VERY HIGH. The "resistance" of the base-emitter junction is about 1k and the signal will find it very difficult to rise above 600mV because the incoming energy is not sufficient to increase the voltage. Adding a capacitor between the base and the front end allows the transistor to be self-biased and get a turn-on voltage of about 600mV from a base-bias resistor. This allows most of the energy for turning on the transistor to be supplied by the base-bias resistor and the energy from the tuned circuit can assist in turning the transistor on and off to produce the audio. The FRONT END is now separated from the transistor and ANY voltage it is producing will be passed to the transistor via the capacitor. The Front End does not produce the 350mV immediately. It takes thousands of little pushes to gradually increase the voltage, but at 1MHz, this does not take very long. Whereas, with the crystal set, the first 350mV could be produced without any loading, the circuit is now loaded AT ALL TIMES. This means we have to load the circuit as lightly as possible to be able to pick up individual stations. The only way we can do this is to use a capacitor of the smallest practical value and this has to be worked out by trying different values. If the value is too small, the transistor will not detect a small signal. If the value is too large, the circuit will stop working. Values such as 1n, 10n and 100n are suitable. Values such as 1u, or 10u will be too large. Another way to talk about the amazing properties of the FRONT END is to explain its ability to convert a very weak (small amplitude signal) as small as 1µV to 5mV into a 500mV signal. A radio signal loses amplitude as it passes through the air and by the time it reaches your radio, it is only a few microvolts or millivolts in amplitude. All the other signals are "fighting each other" and having no effect on the FRONT END. The FRONT END is made up of a coil and capacitor and it is also called a RESONANT CIRCUIT because it resonates (oscillates) at a particular frequency. The only signal picked up by the coil (and passed to the capacitor) is the station we want to hear. It passes it to the capacitor and the capacitor passes it back to the coil and the radio signal adds to the amplitude and after a few thousand cycles, the amplitude is as high as 500mV. The fact that these two components can produce a high voltage from a very small energising voltage is due to the constant "pushing" effect of the signal as it gradually increases the voltage flowing between the two components and it can convert the 1µV wave into a 500mV signal. The amplitude is not produced immediately. It takes time (a few thousand cycles) to build up to a maximum value. A Crystal Set should be one of the first projects on your list. It was the first major project I built when I was 12 years old. I was listening to a radio station and at the same time I had another crystal earpiece in my other hand and was connecting the leads to various parts of the crystal set. All of a sudden I heard noises that were not from the radio station. I suddenly realised I was listening to sounds in the room and I had made a very simple amplifier. This was the beginning of my interest in amplifiers and from there I went on to flip flop circuits and other digital circuits and eventually to microprocessor circuits then microcontroller circuits. But you have to start somewhere and there is no better place to start than making your own home-brew CRYSTAL SET.